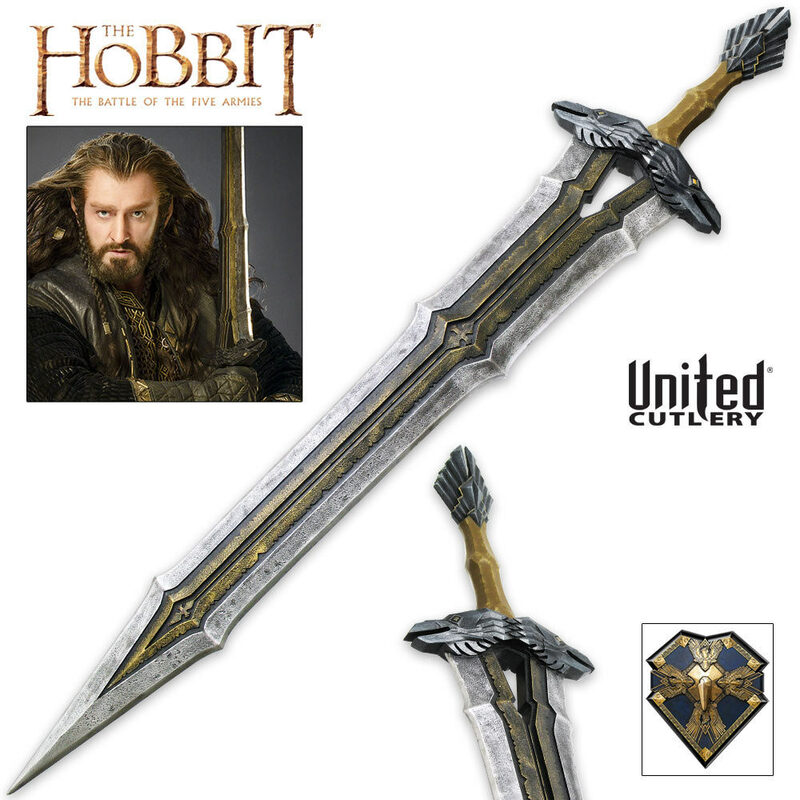 Regal Sword of Thorin Oakenshield | BUDK.com - Knives & Swords At The Lowest Prices! This product stunning! Glad I finally got it. I thought it would be like a broadsword but its actually kinda small. due to it being a cast replica it feels more like a toy than a weapon. This was much nicer than I expected and much nicer than it appears in the pics and video. Not quite as big as the pictures make it out to be. It is a big sword, but big for a dwarf if you know what I mean. Yes, its poly-resin, but it does nothing to detract from the sword itself. Excellent paint and nice details on the sword. The wall mount is also resin and has some serious weight to it. That thing has to weigh at least 5 pounds. Make sure you mount it securely! Speaking of the mount, probably UC's best Hobbit/LoTR mount of any sword so far. It looks fantastic. The packaging was a tad different however. It came in a fairly big, standard cardboard box, but did not have the slipcase cover like the other UC Hobbit weapons. Instead, it has a 8x11 color picture of the sword glued to the side of the box. No big deal. But I thought that was a little odd considering this is by no means UC's biggest sword and the rest come in a nice slipcase package. Honestly, I can't think of any downsides to this sword. I would never have bought it at its original $269 asking price, but for $107, its well worth the money and looks fantastic when mounted and displayed. For the new low price, buy it. Its worth it! Great buy for the reduced price. Unbalanced and odd in the hand but pretty awesome to have a Dwarven sword. Grab it while you can because at this price it will be gone soon. The plaque is pretty cool but I would say this is one of my heavier wall hangers, make sure you mount it securely. disappointed ... the sword is made of resin and it is not a surprise. The sword is rather well done. But the ravens on guard and pommel are supposed to be obsidian so shiny black. United painted in matt blue. This does not correspond to the film. The wall plate resin is not very successful. It does not put the sword value. it does not go with wall plate wooden collection. 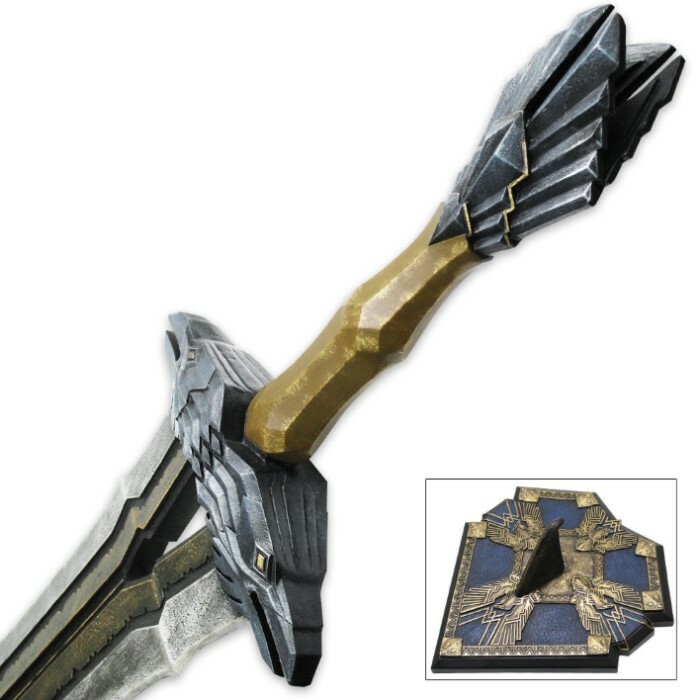 The ravens of the sword can be repainted, wall plate can be replaced ... but the scale is wrong. This is not exact film replica. The sword is the accessory to the scale of the actor Richard Armitage and not the sword of history at the dwarwes an Thorin scale. She is too large, as large as Orcrist! This sword is an amazing replica of the movie sword. 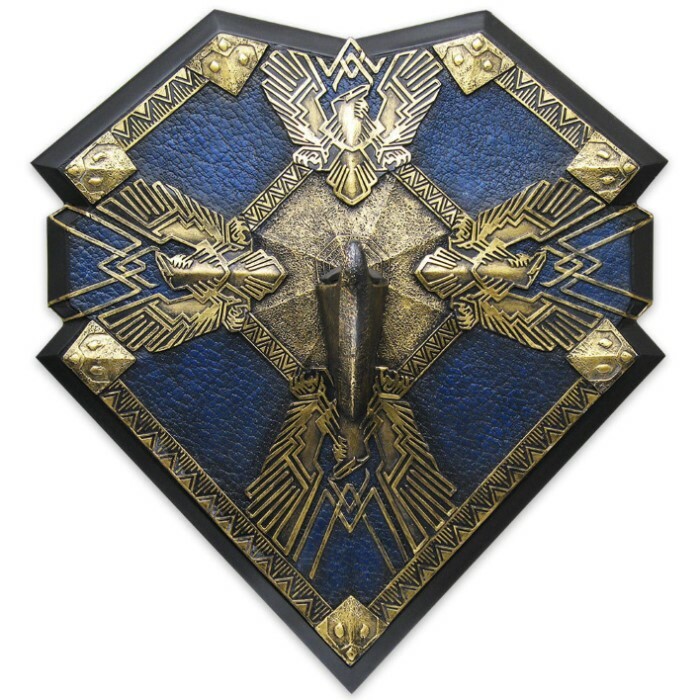 The raven motif is stunning and the plaque is one of the best created in the line. The only reason I did not give this a 5 star rating was due to the polyresin finish. I understand the use of this material, but I prefer real metal weapons. Still a great addition to my collection.